"When I was younger, I had a hard time not saying certain words in front of you. I knew it was an issue when we were at a restaurant and you dropped your french fries and you said, '$h!#' loud enough for people to hear. The button was to remind me to choose my words and say, 'rats' instead." As I grew up and had Sweet Pea R, I realized that while I don't go around cussing like a sailor, occasionally I let an S-bomb or other choice word fall. 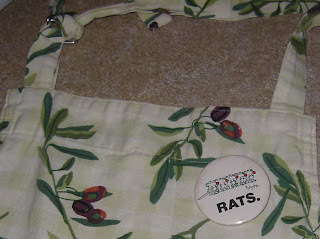 So a couple years ago, I opened up gift box and my mom had wrapped up, you guessed it, the "Rats" button. Now I proudly wear it and count it as one of my most prized possessions. 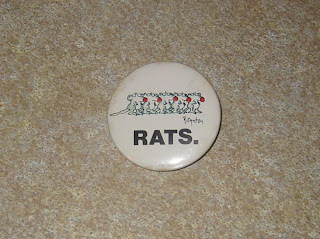 little did I know that "Rats" would be famous! Hope it helps other busy moms! I need one of those. I bumped my head one Rachel's old tricycle that's hanging from the rafters of the garage and responded with a choice word of my own. The kids were sitting in the car with windows down. I'm pretty sure they heard me. I'm also pretty sure that if they ever chose to imitate me it would be while they were at preschool or Sunday School. This would have been helpful about a year ago...E's a lost cause at this point. Maybe we can shield A from the potty mouth that her mama (and daddy and grandparents) have! I definitely need one of those! Friday Night Bites--Carnilupa or Chalitas? Are you ready for some Fo..ndue?